Have a great idea for a song but aren't around your computer? 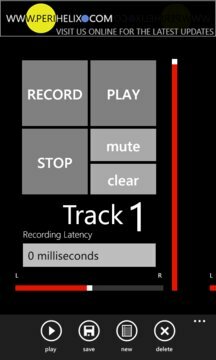 Record up to 4 tracks of audio right to your phone. 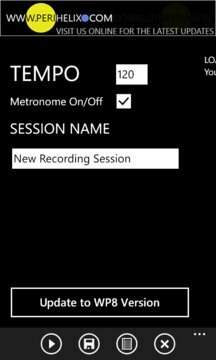 * Built in metronome and tempo control helps you keep everything in sync. * Save as many sessions as you'd like to your phone. If there is free space on your phone you can record another song! * Individual volume controls let you mix the audio to your liking. * Moved master control buttons to the application bar for easier access. * Set the recording latency for slow devices. * Fixed issue with v1.0 sessions being loaded. * Left and right panning of individual tracks. * Saves volume and panning for individual tracks.